The Malabar large-spotted civet is found in the Western Ghats, a mountain range found in West India. Civets are dog-like in appearance, with long legs and canine heads and muzzles. This species is believed to weigh between 18 and 20 lbs and can probably reach up to four feet in head and body length. This information is only based on similar civet species, and exact measurements for this creature are unknown. Its coat is gray in color with darker patterns, and there are five white rings on the tail. It also has a black dorsal crest that extends from its neck down to the tip of the tail. Malabar large-spotted civets were once found in lowland forests, but today are confined to thickets in cashew plantations and highly degraded lowland forests. They are very aggressive even with other civets and prefer to be alone. They are also nocturnal and hide in the forests during the day. Diet consists of small animals such as reptiles, small mammals, fish, birds, and amphibians. They will also eat eggs and plant matter. Little is known about the reproductive behavior of this species. 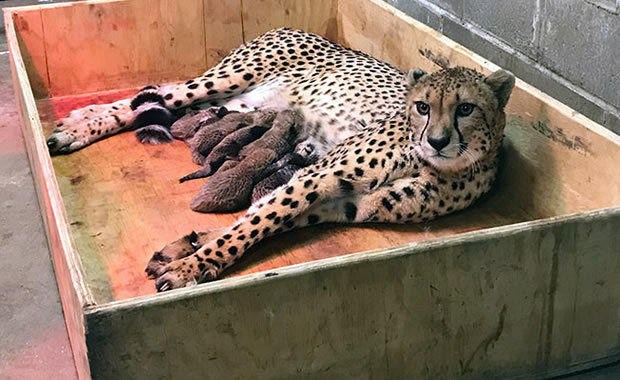 Females are known to give birth to an average of two to three young per litter. This species is threatened by loss of habitat due to deforestation. Also, cashew plantations (where many of the civets have been forced to dwell in) are threatened by large-scale clearance for planting rubber. This species is also sometimes captured and killed accidentally by hunting dogs. Some are also killed by humans that consider them pests. The species was listed as endangered in 1979, but very few additional conservation measures have been taken to preserve the species. Copyright Notice: This article is licensed under the GNU Free Documentation License. 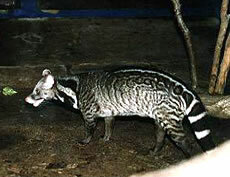 It uses material from the Wikipedia article "Malabar large-spotted civet". Glenn, C. R. 2006. "Earth's Endangered Creatures - Malabar Large-spotted Civet Facts" (Online). Accessed 4/20/2019 at http://earthsendangered.com/profile.asp?sp=75&ID=3. Need more Malabar Large-spotted Civet facts?